Bring a professionally sleeved look to your system with theEZDIY-FAB Basic Cable Extension Kit. Designed for use with graphics cards with one 8-pin port and one 6-pin port, this selection of extensions includes the most popular and visible cables, and is a great way to give your system a splash of style without breaking the bank. Just like our full cable kits, these cable extensions are 100% heatshrink-free for a clean and professional look. Best of all, these are compatible with every power supply on the market, making them a great way to enhance the look of any build. Our extension kits even come with a set of cable combs as a special bonus! Length: 19.68in (500mm). Wire AWG: 18AWG, 3.3mm(Rohs). Sleeve Tube: PP Material. Insulation Resistance: 20M ohm at 200VDC. 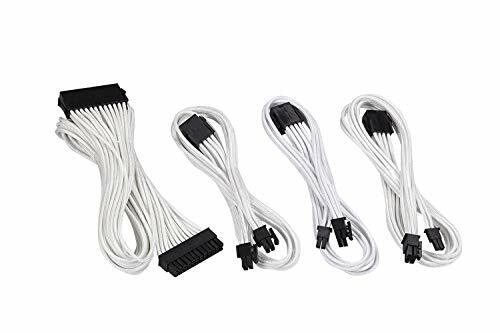 24 Pin/ 8pin (4+4) M/B, 8pin (6+2) PCI-E Extension Cable Kit, cable combs included. If you have any questions about this product by EZDIY-FAB, contact us by completing and submitting the form below. If you are looking for a specif part number, please include it with your message.